David Height, Mitsui Fudosan’s Director of Planning and Engineering, took part in a panel discussion in the WestWorks studio on 25 April. 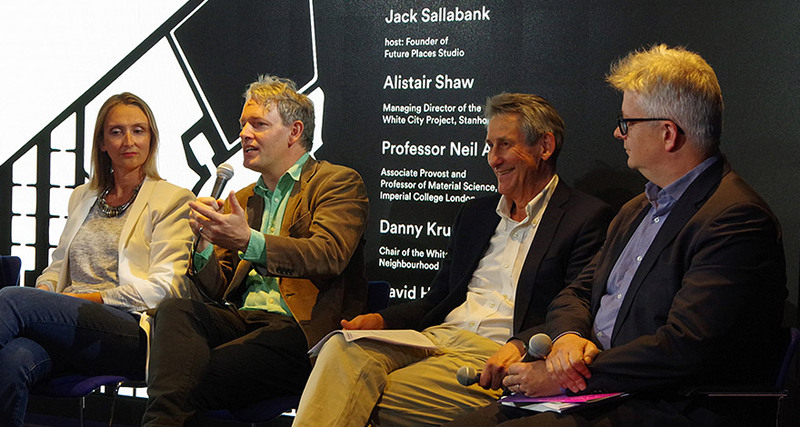 “What Does the Future Hold for White City?” was hosted by Jack Sallabank, founder of the Future Places Studio, and attended by more than 50 guests including local MP Andrew Slaughter. The event marked the launch of a new book, ‘White City Story’, which catalogues the changes and modernisation White City has undergone in the last eight years. Much of the panel’s lively discussion focused on how best to ensure that the benefits of the redevelopment are felt by all in the local community, as well as how to maintain the openness and accessibility of the new sites to the local residents. Joining David Height were Alistair Shaw, Managing Director of the Television Centre redevelopment at Stanhope, Jenni Young, Managing Director of Upstream, Professor Neil Alford from Imperial College London, and Danny Kruger, the Chair of the White City Neighbourhood Forum. Food and drinks were provided by Wellbourne Brasserie, which launched a new restaurant in the WestWorks building at the end of March.